Recognizing the needs of adult learners, the Adult and Continuing Education at Kansas State University Olathe Campus is announcing the launch of a 15-credit hour Graduate Certificate in Leadership Dynamics for Adult Learners. This Graduate Certificate emphasizes relationship skills, leadership, and communication based on adult-learning theories and principles and can be used to strengthen both personal and professional skills. This program will assist any working professional seeking to expand their skills in the areas of organizational leadership, interpersonal interactions, and multicultural and global perspectives. Heavy emphasis will be placed on the learner’s practical application to a specific work setting. Launching at our Olathe Campus, coming soon online. The following15-Credit hours are required to complete the Leadership Dynamics for Adult Learners Graduate Certificate. EDACE 839 Experiential Learning and Leadership Dynamics (3 credit hours) or course equivalent approved by program coordinators. The first four courses may be completed in any order EDACE 839 Experiential Learning and Leadership Dynamics must be the last course in sequence. Courses are offered on a rotation basis. 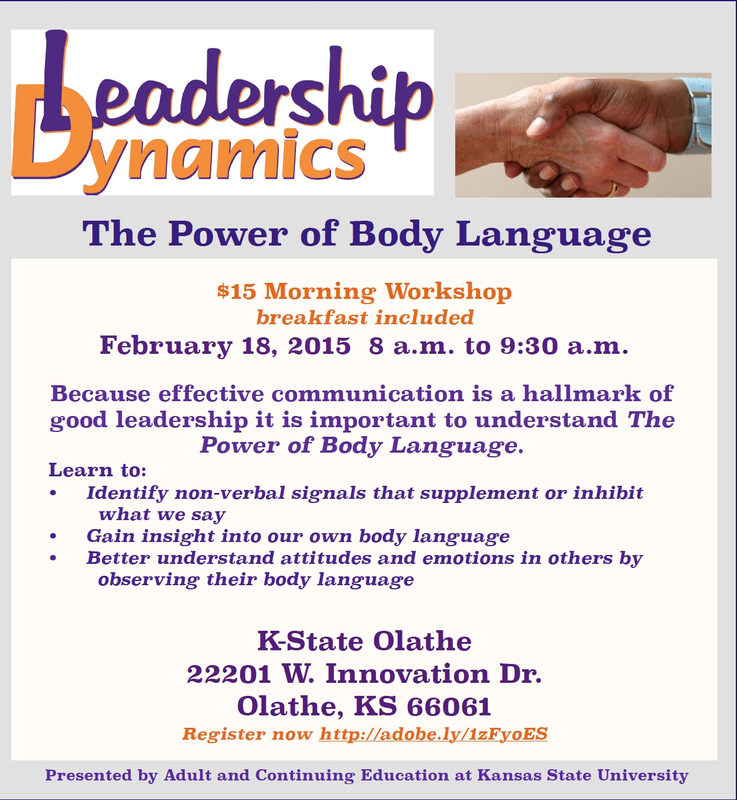 To kick off our new certificate there will be a Leadership Dynamics Workshop on The Power of Body Language February 18, 2015 from 8 a.m. to 9:30 a.m. at the K-State Olathe Campus 22201 W. Innovation Drive Olathe, KS 66061. Register Here! ‹ Why a Master of Adult and Continuing Education at K-State?